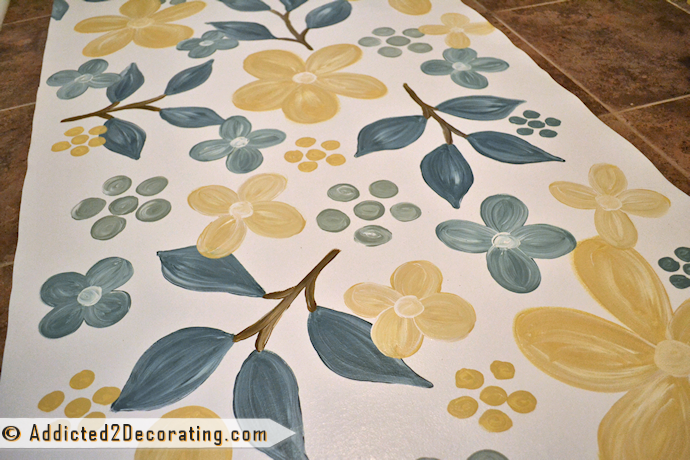 Yesterday, I finished up one more big project for my bathroom makeover. 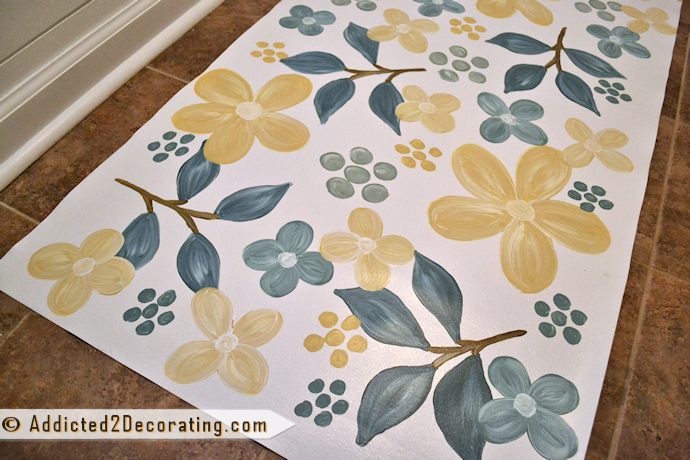 I made a floral hand painted floor cloth. You have no idea how hard it was for me to not do stripes. Stripes are my go-to design for projects like this. 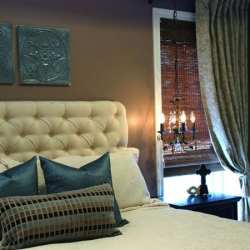 They have great impact in a room, and they’re incredibly easy to do. And most importantly, I love how stripes look. But this time, I forced myself to do something different. I made myself step out of my comfort zone and tackle a different kind of design altogether. I loved the idea of big, bold flowers and leaves, but I wanted mine to have a little more variation in color. So I ended up using four different paint colors (not including the brown for the stems), and I mixed in lots of white for more variation. I painted the whole thing freehand, and as you can see, the shapes are really very basic, like the kind I drew in elementary school. 🙂 But it’s the white paint that really gave these little flowers and leaves life. 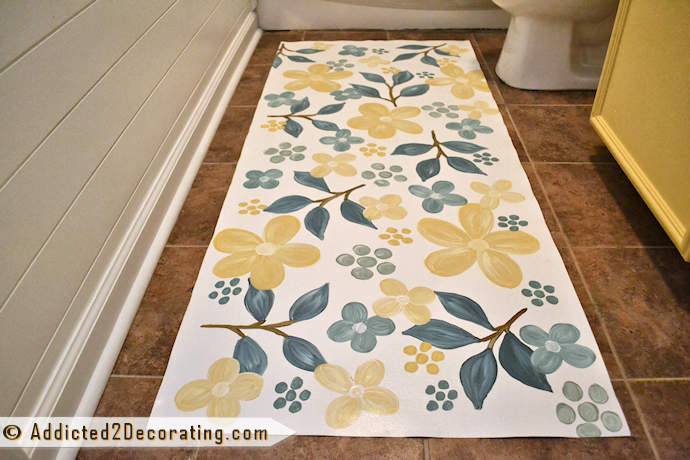 But if you’re not artsy, and don’t think you can paint your own flowers and leaves, you can always use this easy method for making a floor cloth from fabric. So that leaves me with one major project left in this bathroom makeover — the shower curtain. And sadly, I’m still not settled on a design. I’m clearly making this much harder than it should be!! I think I’ll head over and read all of your suggestions again and see if I can make a decision. Next Post How Should Power-Tool-Using DIYers Handle Less-Than-Understanding Neighbors? 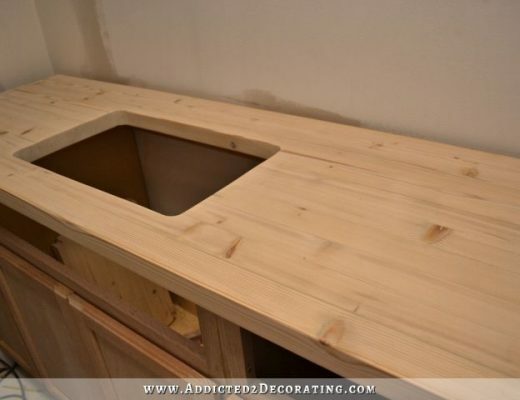 The before/after on your bath will be so dramatic. I was actually going looking for the before when I saw that you had posted your floor cloth and I was “floored!” I’m glad you mentioned stripes, I had absolutely expected stripes but love your happy flowers. I LOVE that!! It’s so cute! And I love the wood shelves above your toilet! Your bathroom makeover has been so fun to read about – you have such great ideas. Love it!!! The design is great! Wow! Love love love this! It is so beautiful and I wish that I had one just like it for my bathroom. I don’t think that I could paint one to look like yours though 🙂 Still cannot wait to see what you come up with for the shower curtain. I love it! Your bathroom is so cheery! I love it when you put your creative painting hat one. The rug is perfect!! Loveeee! So cute. 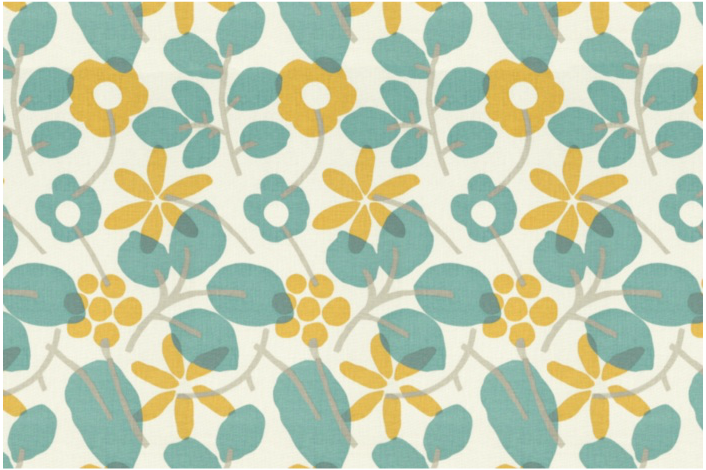 Love the colors & the simple flower design. Looks great! LOOOVE it! You did an amazing job! WOW that came out fantastic, you did a wonderful job, I actually like your design better then your inspiration, love the design it is beautiful! Can you give a little more of a tutorial on this rug please? What type of cloth, paints, etc.? Awesome! You’re so creative and talented! This bathroom makeover has been sooooo much fun to follow! It’s turned out beautifully! Very cool project! I know what you mean about stripes. That’s my style too. I really appreciate all of your blogging tips! Gosh, your Alexa number is really getting good girl! I am teaching myself HTML thanks to you. Put a paintbrush in your hand and it’s magic!!! : ) Put a paintbrush in my hand and it’s like kryptonite to Superman! 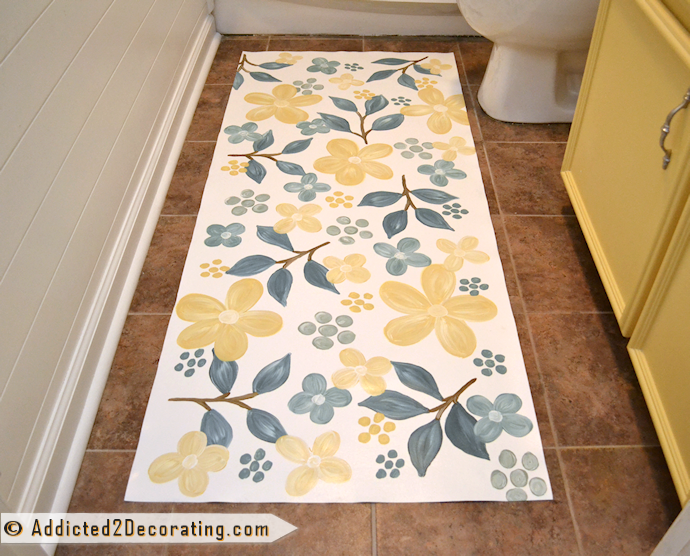 : ( This painted rug looks amazing (sorry to use the same adjective repeatedly) and I can hardly wait to see the completed bathroom. Keep on working your magic. Ahhhh, I can see this little gem perfectly accentuating your artwork. Great idea. How did you seal the paint, or did you? I guess I mean to say the the rug accentuates the wall art you did. I actually haven’t sealed it yet, but I do plan on using two or three coats of non-yellowing varnish on top. Oh, I love the florals! It turned out so pretty, Kristi. 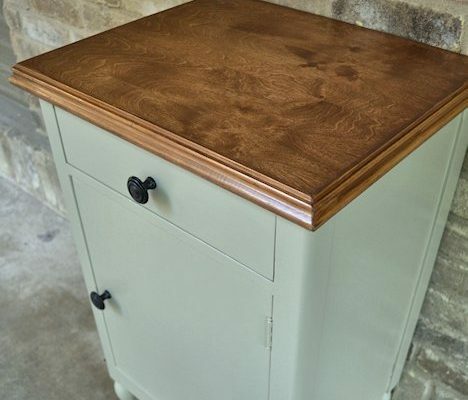 It looks perfect with the sink cabinet color. This is gorgeous and I would absolutely love to try it myself! I saw that with your kitchen stripped vinyl, you white washed followed with semi gloss brush laquer then finished with clear matte spray. Did you use those three with your bathroom vinyl piece? *I read above that you hadn’t sealed it yet, but that is necessary, not just for gloss but to protect it? How do you keep the edges of the vinyl from curling?